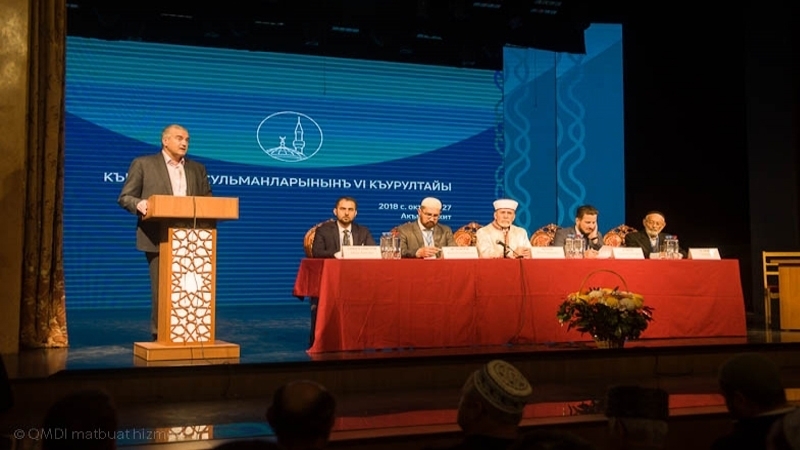 On October 27, a congress of Crimean Muslims was held in Simferopol. The organizers themselves called it the VI Qurultay of the Muslims of Crimea, implying that it inherits the tradition of the previous Qurultays. For example, the fifth was held in September 2013, a few months before the occupation of the peninsula. Muslims gathered in the building of the Crimean Tatar theater in Simferopol. The Crimean Muftiate controlled by the occupation authorities reported 308 delegates in the hall. Apart from them, the “head” of Crimea Sergey Aksyonov, the Crimean “vice-speaker” Edip Gafarov, and the MP of the State Duma of Russia Ruslan Balbek appeared and spoke at the congress. In 2016, the Spiritual Administration of Muslims of Crimea was created in Kyiv, headed by Ayder Rustamov. The Mejlis of the Crimean Tatar people designated the congress held in Simferopol as a priori illegitimate and called on compatriots not to participate in it. The Deputy Head of the Mejlis, Akhtem Chiygoz, stressed that the participants in the meeting in Simferopol were not elected as delegates. “This is an attempt to defame representative bodies by means of some groups of collaborators. They gathered marginal groups, pulled out religious communities controlled by the occupying muftiate, dependent people and try to pass it off as a religious Qurultay. Most of these communities are registered under Ukrainian law and were not re-registered under Russian law,” Chiygoz noted in a comment to QHA. Emirali Ablaev delivered a report at the congress for the previous five years. It became the fifth in his career - for the first time Ablaev led the Muslims of Crimea in 1999 and before the annexation of the Crimea he was successfully re-elected. The meeting participants supported his candidacy. There was no one to object. Dissenters were just not allowed into the hall. The scandal with the election of "mufti" broke out a month before the October congress. The Crimean resident Riza Ganiyev announced his plans to run for “Qurultay of Muslims” as an independent candidate and said: according to the regulations of the Crimea’s Muftiate, the leader of the Crimean Muslims should have a higher spiritual education. Ablaev does not have one, which means that his re-election is unacceptable. In addition, Ganiyev reported on fraud and theft on a large scale on the part of the Spiritual Administration of the Muslims of Crimea, controlled by the occupation authorities, and applied to the Russian FSB, the Ministry of Internal Affairs and the Prosecutor’s Office with a corresponding statement. On October 27, Ganiev came to the Crimean Tatar theater, but did not get to the event. As he explained on his facebook page, the guards stated that his name was not on the lists, and asked to leave. So it turned out that loyal to the Russian authorities Emirali Ablaev was the only candidate and will remain the “mufti of the Crimea” for another 5 years. The second high-profile event was the intention of the muftiate to carry as an asset several premises belonging to the Crimea Fund, namely, the three-story building on Schmidt Street in Simferopol, where the central office of the Mejlis was located before the annexation. Now this building is empty. At the congress, they stated that the building "was purchased with charitable funds, and it belongs to the people." The meeting participants appealed to the Crimean "authorities" with a request to transfer the object to the Crimean "muftiate" in order to create a Museum of the cultural and historical heritage of the Crimean Tatars in it. In turn, Sergey Aksyonov said that the topic of “nationalization” in Crimea is closed, but he allows for the development of a special mechanism for transferring the building to the “Spiritual Administration of the Muslims of Crimea”. A member of the Mejlis, Eskender Bariev, believes that the Congress of Muslims in Simferopol pursues another goal. Russia seeks to replace the highest representative body of the Crimean Tatars. Since 2016 the Mejlis cannot openly work in the Crimea as the Supreme Court of Russia has banned its activities. According to Bariev, the Mejlis is already preparing appeals to international organizations asking for an assessment of what is happening in the Crimea.